This shooting was technically difficult and we have been planning it for several years. The idea itself came to us in 2007 after we had created such panorama with the help of a 4-meter pole. In January 2010 we chose time, arrived in New York and shot night sphere from the window of the Millennium Hotel. There was number of key difficulties. The same shooting with the external pole is always made at day time because the pole with a camera swings from the wind with amplitude of 10-15 cm like an aspen leaf. And for that reason the short exposures are needed to take photos. Truly speaking, the tripod was in the room and a fastening system assured one and a half meter long bar which had been combined from two elements by RRS to be out of the window. In order 5 kg construction (camera, object glass, panoramic head and fastening) wouldn't fly down together with the tripod we used a counterbalance consisted of 3 big Cola-Cola bottles. The bottles were put in a plastic bag and were hung on the bar inside the room. The second difficulty was a depth of field. The field must be from 40 cm to infinity and we couldn't close a diaphragm much because of the long exposures. A focusing on hyperfocal distance resulted unsatisfactory. Besides, we couldn't put the camera further too because we needed to be able to handle it to rotate. Finally, we decided to use a method which is usually used in a landscape photography (well, we are actually the landscape photographers :)) and named "sharpness compensation". 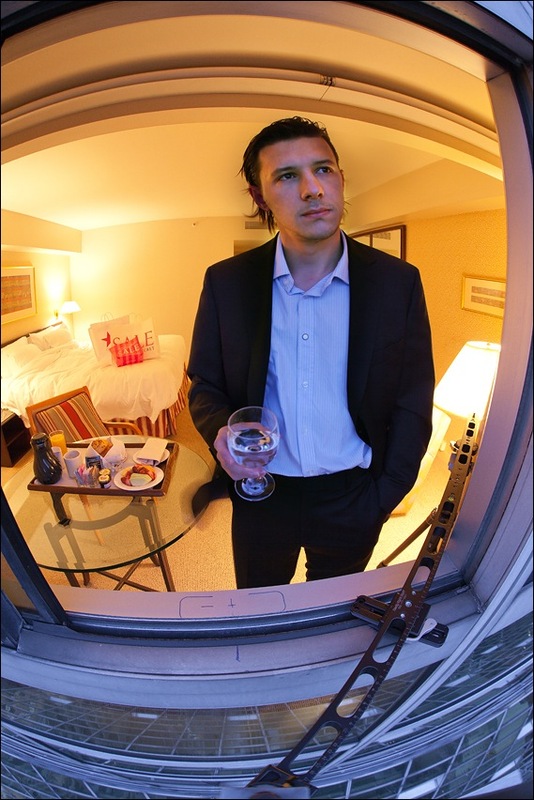 Speaking in brief, the city was shot with the focus on infinity but the room, our window and the closest windows of the hotel were shot with the focus on 1 m.
The camera was managed with the radio remote control which was fixed in the camera's hot shoe. Another difficulty was a dynamic range of shooting scene. We had to adjust scene brightness out and inside the room to the camera's range. To realize it we manually calculated the exposure compensation for each shooting series and measured the utmost range points out and inside the room. We used HDR's techniques in fact. We decided that we would shoot this sphere in high resolution using 16 mm fish-eye according to the following scheme: 6 shots going in circles and 3 shots to zenith using slim-rotator. It made our work more difficult because if we shot with low resolution (three shots using 10 mm fish-eye) many things would be easier and we would make much fewer efforts. In the beginning we were going to shoot nadir (down view) too but if we rotated the camera down out of the window we would spend too much time. As a result, we refused to shoot nadir right in the process of taking photos, although the slim-rotator allowed doing this, and retouched it during processing. We used the following equipment: camera Canon 1Ds MarkIII and objective Contax Carl Zeiss 16mm Fisheye adapted to Canon. First, we tried to shoot with old good "Fivy" (Canon 5D MarkII), but we discovered that exposure compensation range of "Fivy" (+/- two stops) wasn't enough for the scene shooting inside and out of the room. And as it was extremely inconvenient to change the exposition of every shot in the camera manually when it was hanging in the air at a half meter distance from the window and 120 meters from the ground, then we had to change the camera itself. Taking in consideration objective and other equipment the total amount of the hanging in the air construction was about $15'000. One difficulty more supposed that all we mentioned above was necessary to do very fast because the shooting held in so named short "blue hour" when evening illumination is more attractive and changes very fast and the total sphere shooting cycle with exposure compensation and camera's rotation out of the window took about 5 minutes. Before we left for New York a general rehearsal had been held. 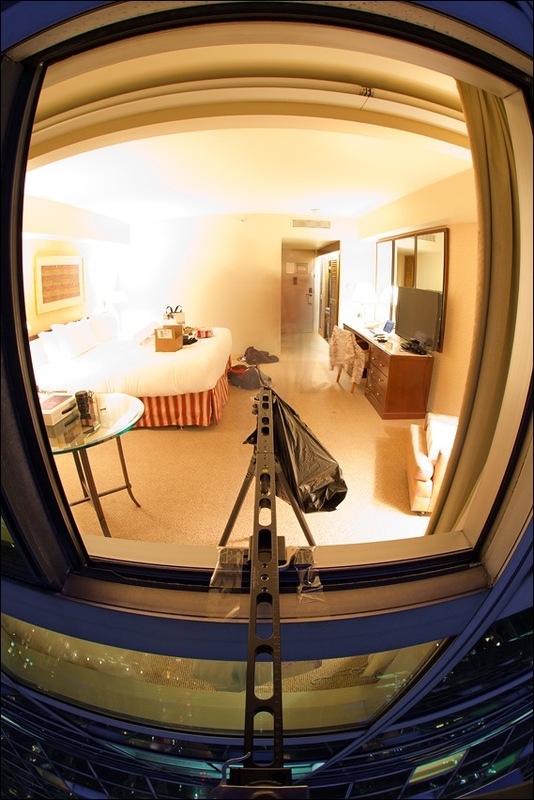 We constructed a test stand imitating the windowsill at the hotel and under local conditions made the corridor shooting running two of us around the camera which had been fixed on the external bar. The list of shooting preparing operations occupied the whole sheet of paper like a Boeing pilots' check-list before a take-off. We had a not resolved till the end problem how to fix the spherical head with the camera to the bar out of the window. During the test, while rotating, the heavy construction right in my hands unexpectedly broke the duralumin bolt which had fastened the bar and the head. Another one problem was the way how to get the needed room at the hotel with the view to Manhattan. The hotel itself consists of two towers but for the shooting we needed only one side of the West Tower with a "right" view. We resolved that problem by making good relationship with a concierge who was reserving a room we needed on a desirable floor. Sergey Semenov, who had to shoot this complicated panorama, had never shot spherical panoramas before and his attitude to them was skeptical enough. Though I saw with a heavy heart the way he left for New York, I hoped that everything would be fine because Sergey is an experienced photographer. Well, it's better to start with short comments. In New York, as well like in other US cities, there are very few opening windows in the skyscrapers, and if you find any including with a beautiful view, it is a real luck. The Millennium Hotel was occasionally found just in 2005 through the Internet search using the words combination "beautiful view to Manhattan". After, we have stayed there several times. It happened that last year I was there alone and I had to shoot everything by myself without assistants. It was January of 2010, almost my birthday (night of January 5-6). When I flew from Miami to New York, I knew that it wasn't hot that season but I couldn't even guess how. That time I shot from the evening till the sunrise (made many shots with different lights). My room was on the fortieth floor. Wet icy wind blew from the gulf directly to the window, and 7 degrees below zero changed into all 20. It wasn't better even with the maximum turned on heater in the room, two pants, a ski suit and a scarf. And for one hour shooting I froze till the bones. In the middle of the night I understood that I couldn't stand more and decided to do breaks running to the bathroom to heat myself under the shower. After next such heating in the shower instead ski suit I put on the recently bought suit by Boss, brushed back wet hair by trembling hands, stood behind the window and made myself to take several "romantic" shots. The only thing that shows the difficult shooting conditions is a quivering on the wind jacket's edge. The room service doesn't work at night at this hotel and the tray with breakfast, which you can see on the table and is used as properties, can be ordered only from 6 a.m. So, after the night shooting with opened window, first, I slept a couple of hours in the "frozen" room then ordered breakfast and shot several scenes while the sun didn't rise. Well, that is the story of this sphere.